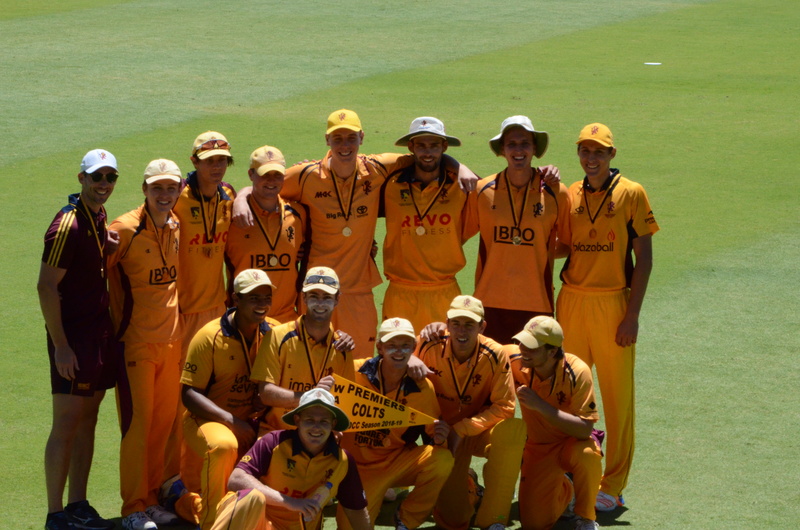 In a stunning game of cricket, Subi-Floreat’s Colts have won the WACA 2018-19 T20 premiership. After electing to bat, Subi were quickly on the back foot at 3-24. It didn’t get any better and at 6-32, things looked very grim indeed. A fighting 19 not out from Jamie Collins, with support from Ben Tredget (13) and Michael Hart (13) saw the boys finish on 9/86. What came next was quite extraordinary. Led by an inspired spell of fast bowling from Lucas Martin (4-14) and exceptional seam bowling from Jack Retallack (3-9), Scarborough was in desperate trouble at 7-39. Michael Hart, Andy Nicholson and Hamish McKenzie then chimed in with a wicket each to skittle Scarborough for 66 and see Subi pull off a truly amazing premiership victory. Ross Williams led the boys in a rousing rendition of the Club song to celebrate a memorable victory. Later in the day, despite their best efforts, the First Grade boys couldn’t make it a double, losing the Premier T20 Grand Final to Melville. Cam Green produced an excellent 66 off 53 balls to lead Subi to 7/141, but Melville reached the target for the loss of only 2 wickets with 3 overs to spare.